There is a lot of talk about fibroids and apple cider vinegar (ACV) and how ACV can help to shrink fibroids naturally. ACV is one of the most commonly recommended natural remedies for many diseases and conditions. One of the reasons it is a common natural remedy is because it is commonly available in most kitchens, is relatively inexpensive and there are little to no side effects. Despite there being little if any scientific research to support the many health claims of using ACV, this is still a common natural remedy. As a natural remedy, many people tout the benefits of ACV for a variety of ailments such as diabetes, weight loss, heartburn, psoriasis, dry skin, dry scalp, dry hair, constipation, high cholesterol, nail and ear fungus, arthritis, dandruff, deodorant, kidney stones, warts, jock itch, yeast infection, etc. While there is little to no scientific proof that ACV may work for many of these ailments, you can find many positive testimonials from people who have used ACV to treat any number of ailments. One thing to remember about scientific research as it relates to many natural remedies is that there is no incentive for vast amounts of money to be spent on researching remedies such as ACV because it will not be possible to patent ACV since it is readily available. The acidic nature of ACV may explain its effectiveness against many ailments and why it is considered antibacterial, antifungal and antiviral but it also contains various vitamins and minerals that our bodies need as well as enzymes and very important anti-inflammatory properties all of which can help to fight various ailments. Many Eastern practitioners believe that sickness and disease including fibroids are caused by an acidic nature in the body and helping the body become more alkaline can help to fight off various diseases and conditions and create a healthier body. It is very important to note that while the acidic nature of acv is touted for the healing properties when used topically, when taken internally, ACV actually has an alkaline effect in the body by helping to raise the pH level from an acidic one to a more alkaline one which can help the body become healthier. Toxins in the body can also increase the risk of developing various diseases and conditions including the development of fibroid tumors. Another of the benefits of ACV is that it helps to detoxify the body. Being overweight is another risk factor for fibroid development and ACV can help with weight loss which indirectly helps to fight off various weight related diseases and conditions including fibroids. These health benefits and many more related to ACV is why many women with fibroids commonly tout its ability to shrink fibroids naturally even in the absence of scientific proof. There isn’t a set dosage but many women take one tablespoon or two teaspoons of acv per day. Because consuming neat acv (undiluted) can wear at the tooth enamel as well as cause burns to the sensitive areas of the throat and mouth, it is recommended to mix it in a liquid. Most people commonly mix acv with about 8 ounces of water, tea or milk (soy, almond milk, etc, are better than dairy milk especially for those with fibroids). Another precaution with acv is to stay away from acv supplements because some studies have shown that these supplements can permanently damage the tissue in the esophagus. 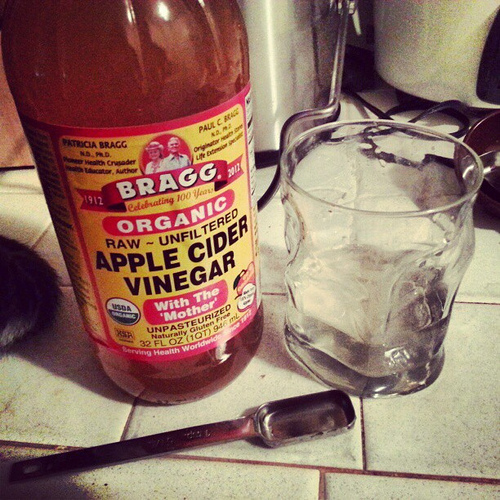 The first recommendation is to of course use ACV and not other types of vinegar (e.g. white vinegar) because ACV is made from apples which is why it contains most of the vitamins, minerals and trace minerals that our bodies need to be healthy. Other types of vinegar such as white vinegar do not contain a lot of these properties. Another point to remember is that there are varying processes that are used to make ACV many of which can eliminate most of the beneficial properties of ACV. This is why most of those sold in grocery stores should be avoided for internal use because they are lacking in healthful properties. The best apple cider vinegar to use as a natural remedy is that which is made from organic apples, that is raw, unfiltered and fermented using traditional methods (unpasteurized). It should also state that it includes the “mother” which is where most of the healthful properties of apple cider vinegar reside. My favorite in terms of taste and quality is Bragg Organic Raw Apple Cider Vinegar (with the mother) which I highly recommend. You can make your own acv if you do not have easy access to good quality acv. There are many recipes that you can find online on how to make acv. Fibroids and apple cider vinegar is definitely an area to consider if you are interested in effective natural remedies that may help shrink uterine fibroids. ACV is inexpensive and relatively side effect free so experimenting with this remedy to see whether it will give you the relief you seek from fibroid tumors will cost you nothing. However, it is important to note when considering fibroids and apple cider vinegar, to remember that the best way to use ACV is as part of a complete holistic treatment approach such as the step by step approach documented in the Fibroids Miracle guide. Find out more about this bestselling holistic guide and the many effective natural remedies which can help you become fibroids free within 60 days by clicking here.